As Ramadhan is approaching, it's important to start thinking about how we would make the best of it, in shaa Allah. The best way to do that, is by making sure we have a set plan. And of course, the best way to plan is by writing it down. Once you make it visual, you would most likely hold yourself accountable, in shaa Allah. 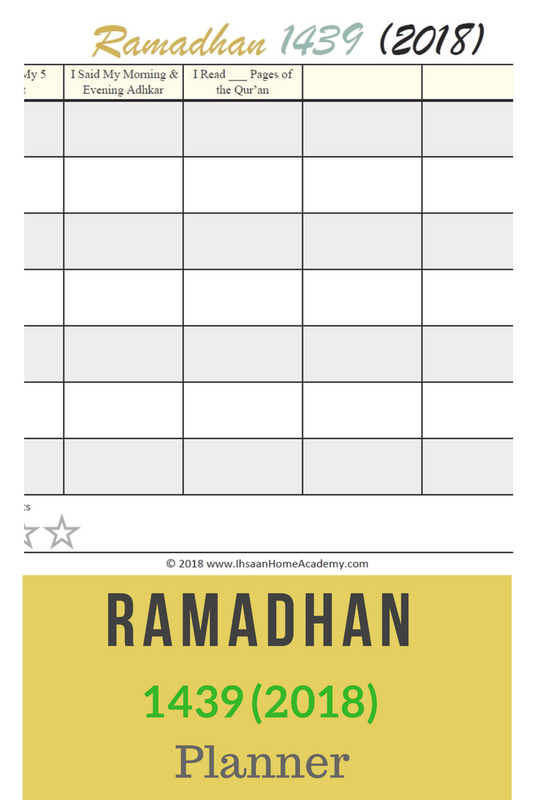 So, I wanted to share with you this simple Ramadhan planner that I put together. This planner was main to have a quick daily and weekly tracker to make it easy to have a productive Ramadhan in shaa Allah. 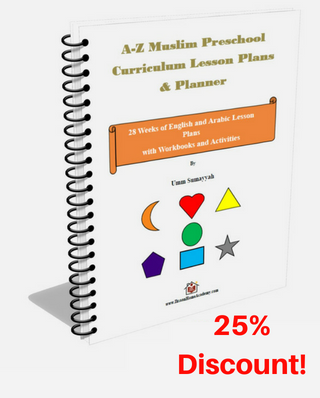 You can also refer to my previous free Ramdhan planners if you want something more. You may have to change the date though. I hope you'll find this planner beneficial. 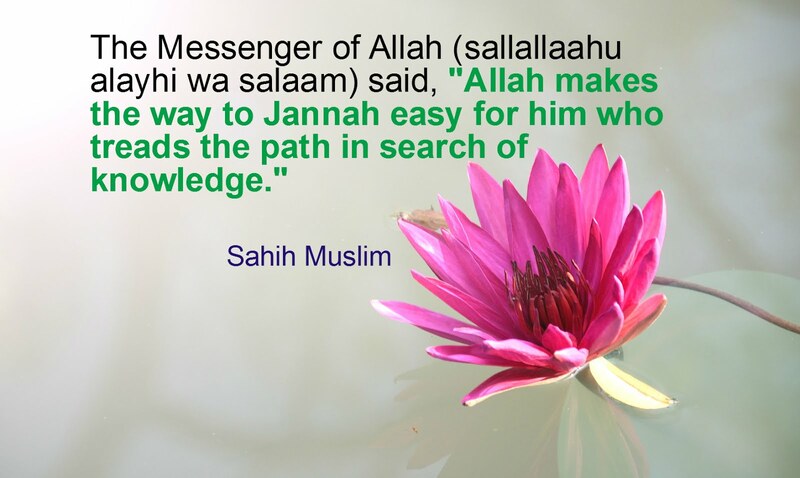 May Allah help us reach Ramadhan, make us successful, and grant us many more Ramadhan to come. I couldn't wait to write about this game, but I was a bit preoccupied with other projects. Now, here we go! 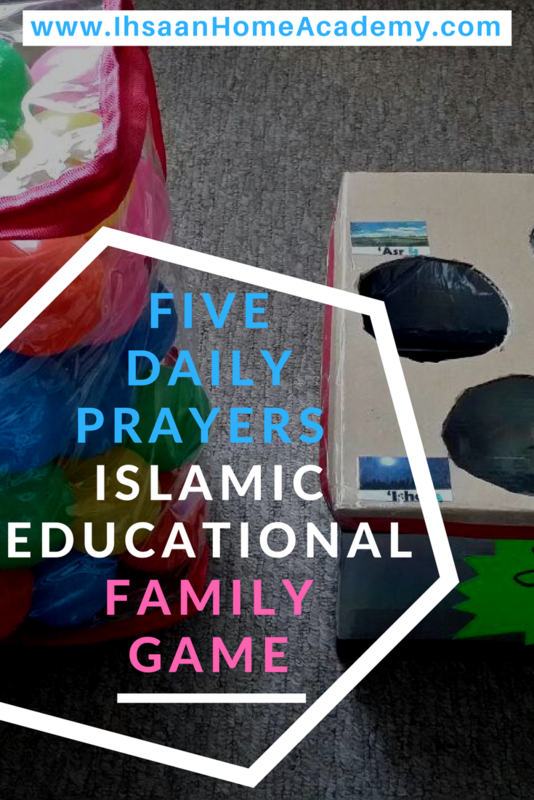 This five daily prayer family game has been a sensation in our home! The thing is, it helps children learn without even them realizing that they are learning! You can also make it competitive for both children and adults. I'll be honest, even I am enjoying playing it. Now, let's talk about how to make it and play it. Now get ready to play! This game has four levels to make it fun and educational. There ya go! You can do similar for the five pillars of Islam and/or the six pillars of Eemaan. I hope you'll find this fun and educational for your children, or fun and competitive enough for the adults. Please, if you try this game, let me know how it went. If you have any questions, kindly leave a comment below. Early learning activities are fun, colorful, simple, engaging, yet very important for children's development. 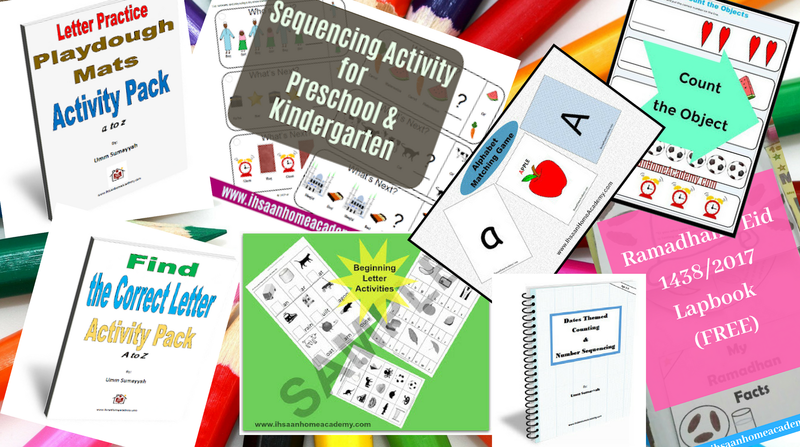 If you have babies and/or toddlers, there are many activities you can make at home without having the skills of making printables. The best things are usually the most simple things. Before your little ones start kindergarten, you can keep them busy, help them to better develop, all while having fun. Below are seven ideas I would like to share with you. This activity is perfect for improving babies' fine motor skill and hand-eye coordination. It strengthens the moving of their fingers, wrist, and their ability to focus. It also helps them understand the concept of objects going through holes; basically. This is a very simple activity to set up, and it doesn't have to be as fancy as the one I made. I made a ka'ba one to familiarise my children to the ka'ba. Hey, any excuse to throw in Islamic concepts, right? 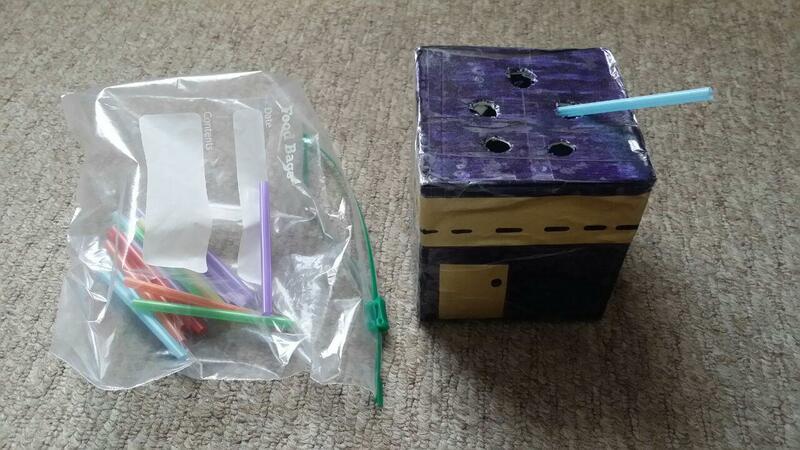 And, you can even use the same ka'ba box to teach your older ones about Hajj. There ya go! 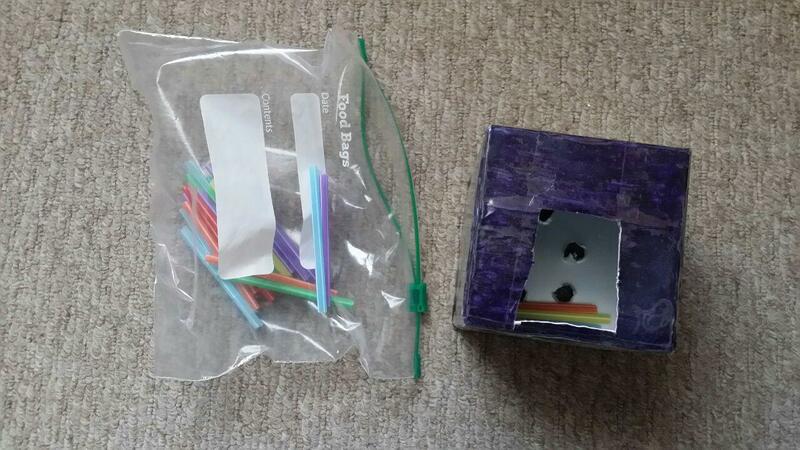 Simply show your child how to put the pieces of straws through the holes. Your kids (even the older ones) will love it! Well, I hope, in shaa Allah. This activity has been a favorite in our home. It's a simple hand-eye coordination activity to help babies guide both their hands and eyes at the same time. It helps them associate what they see and how they use their hands to respond accordingly. This is an important life skill that babies learn as they grow up. If you remember when your baby was a newborn, he/she couldn't throw objects or even hold them at some point. So it's important to encourage the little ones to grab objects, throw them, drop them, and put them through holes. 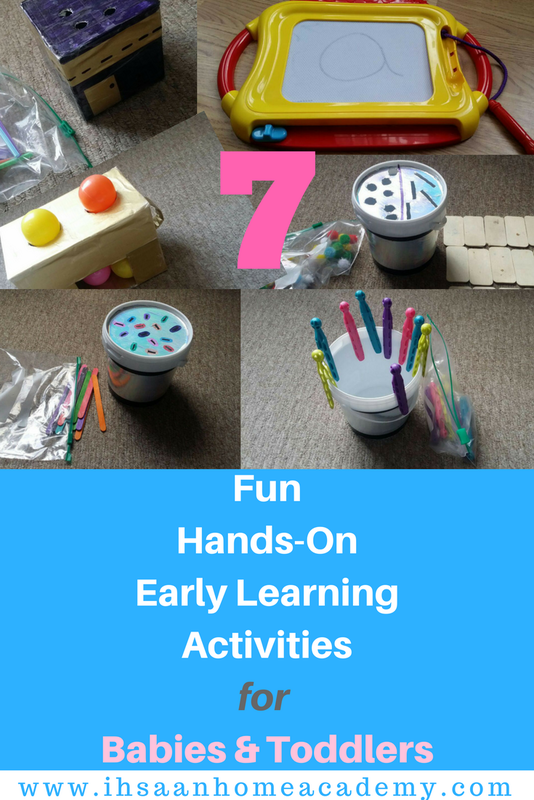 Hand eye coordination activities aren't only fun, but they also help your children develop later skills like writing, dressing up, wearing shoes, etc. Now that we know how important this activity is, let's get to the fun part. 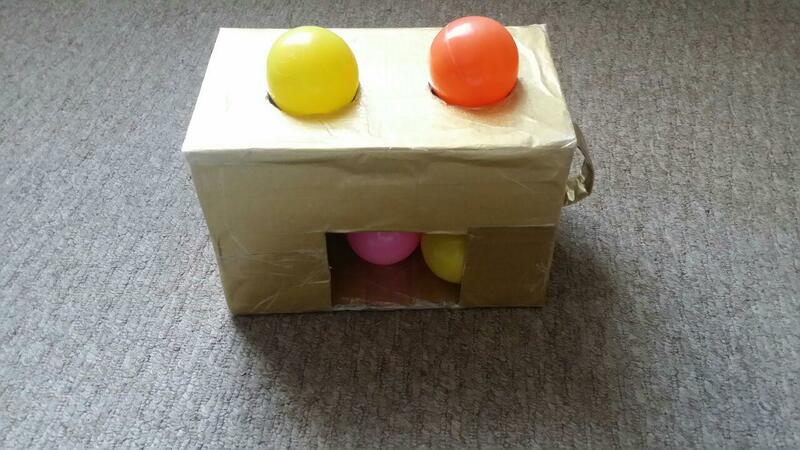 Have your child push the balls through the holes. 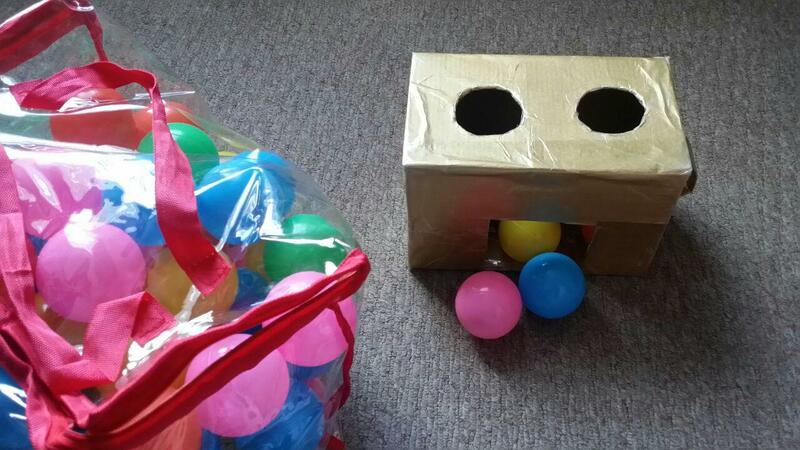 To make it even more exciting (especially for older children), have a race to see how fast and how many balls they could push through the holes. I just thought of this one after using flash cards for a while to teach my child letter recognition. I still use the flash cards, but this one has additional wonderful benefits. 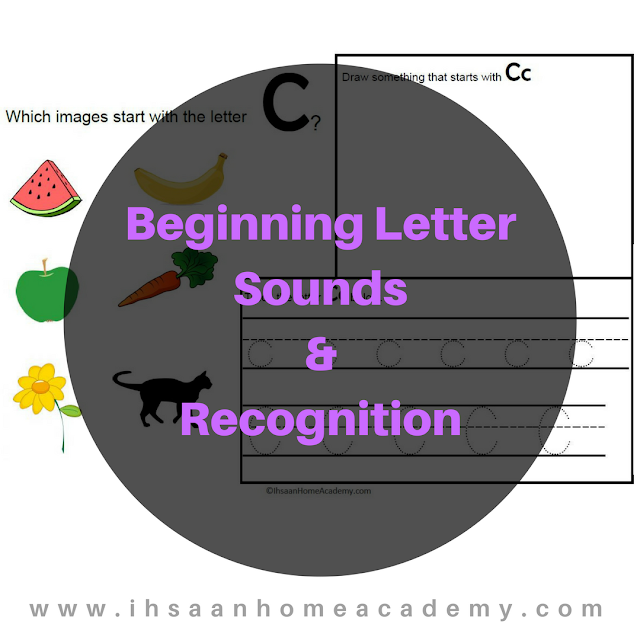 Not only could you use this activity to teach letter recognition, you can also use it to teach your child how to write the letters. What makes this activity special is that your child can learn letter recognition and can sees how the letters are written by visually following the direction you use while writing them. You can expend this activity later down the line by having your child practice writing the letters. 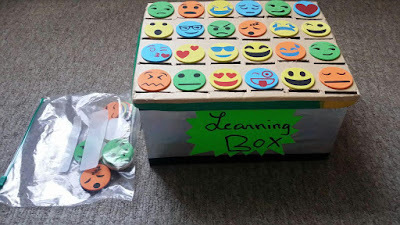 This activity is similar to the golden box, but it involves smaller objects for fine motor skills to help your child learn how to handle small objects, wrist control, and color recognition. 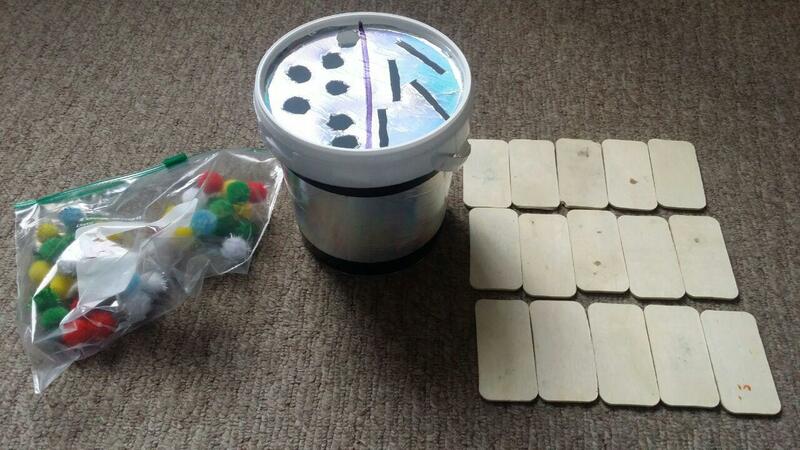 Have your child push the sticks through the holes. Don't worry about the colors just yet until your baby has mastered the activity a little bit. To start teaching color recognition, have your child match the colors to the corresponding holes. This one is pretty similar to the ones above. Again, this activity is similar to the pom pom activity. This is a wonderful and advance activity because it requires lots of focus. Your baby may not be able to do this activity right away, but it's worth introducing it now. 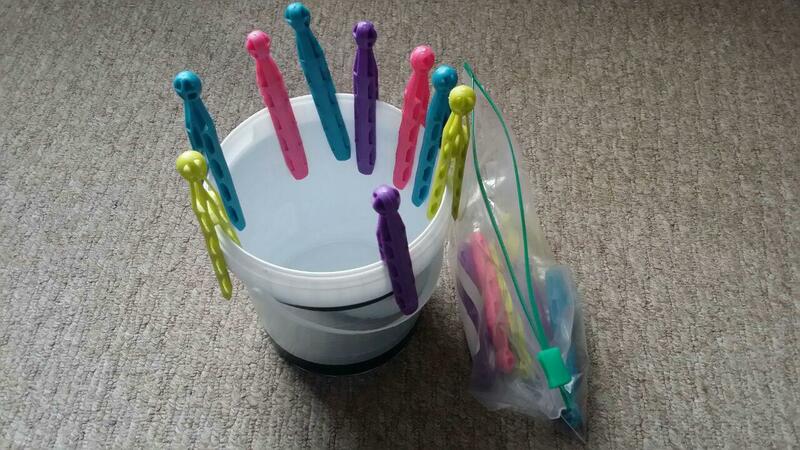 Have your child put the pegs around the container as shown in the picture. Don't worry if he/she isn't able to do it just yet. Just show your baby how to do it by doing it yourself. Let your child play with it until he/she is one day able to put the pegs on the container. You can even move on to the clothes pins/pegs to encourage your child to squeeze to open them in order to strengthen your his/her muscles in shaa Allah. For easy and neat storage, I like using the same containers for multiple activities by only switching lids. It takes less space and makes storing fast and easy. 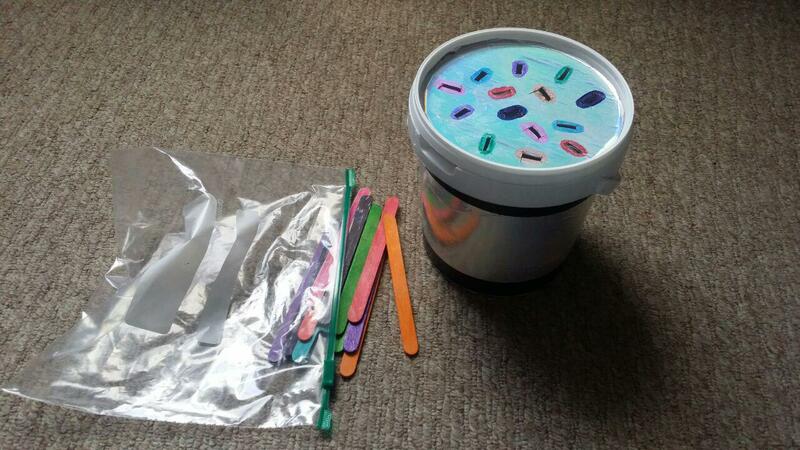 For the little pieces, you can use zip-lock bags to separate and store them, then put them in the containers. You don't have to make these activities exactly the way I made them. These are simply ideas you could use to make your own. Have fun with them, decorate them as you wish, and add varieties if you wish. I like to decorate them so they don't look like piles of trash around the house. 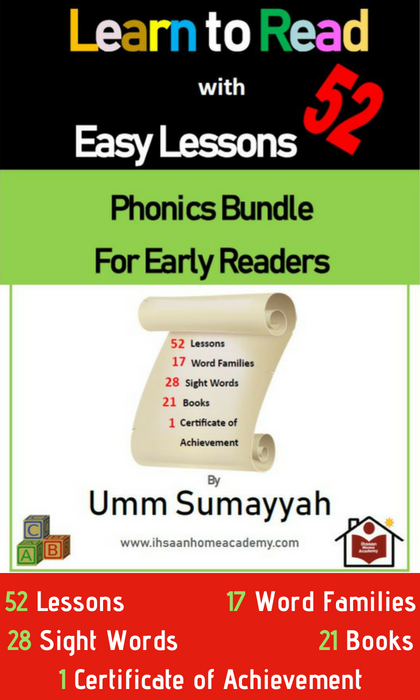 I hope you'd find these activities useful and they will benefit your children, in shaa Allah. 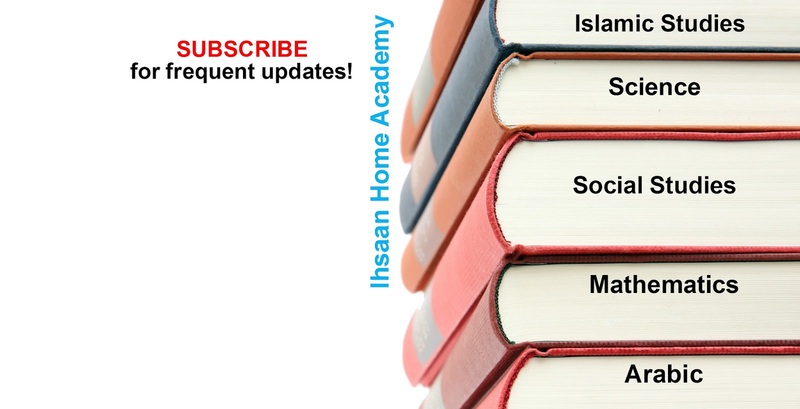 If you have any questions, be sure to comment below in shaa Allah. Here are some of the items you may need, in case you don't already have them and would like to purchase them. You can also purchase them at your closest dollar general or poundland/poundworld. As we all probably know, paying attention to details is a very important aspect of learning. To develop this skill, it is crucial for children to be introduced to activities that involve matching, spotting differences on objects, sorting, puzzles, opposites, ordering (putting objects in order), and similar activities. Visual discrimination is needed to notice big and subtle differences. It helps people notice the color, size, position, and forms of images and objects. It also helps children with reading letters, words, and eventually sentences and stories. When teaching children how to read the alphabet letters, having the ability to differentiate similar looking letters will improve and speed up their reading journey. Some letters are very similar, which can cause the little ones some confusions. The same is true for numbers. So improving children's visual discrimination skill through various activities is very important. I've put together a pack of three different visual discrimination activities to help you kick start this crucial learning journey with your child. 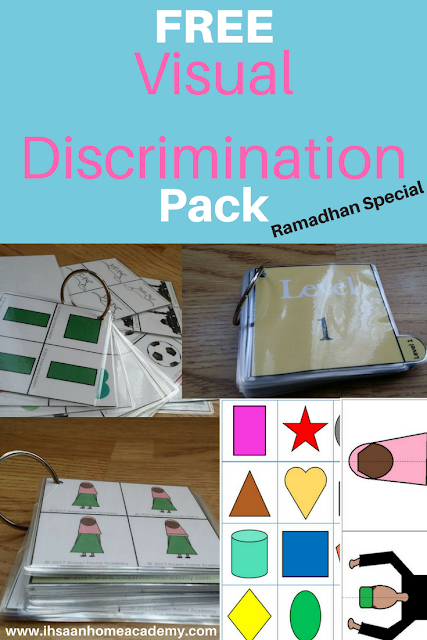 Because this is a Ramadhan Special, you are receiving this whole pack value of £4.99 £3.99 for absolutely free until after Ramadhan 2018, in shaa Allah. What does the pack content? Visual Discrimination Cards: Start with level one. Ask the child to identify the object that is different. After mastering that, ask him/her what makes it different. Move to the next level as the child progresses. If your child is very young, you could start with the matching mat, move on to the puzzles, then the flash cards in shaa Allah. For purchase after Ramadhan, click HERE. 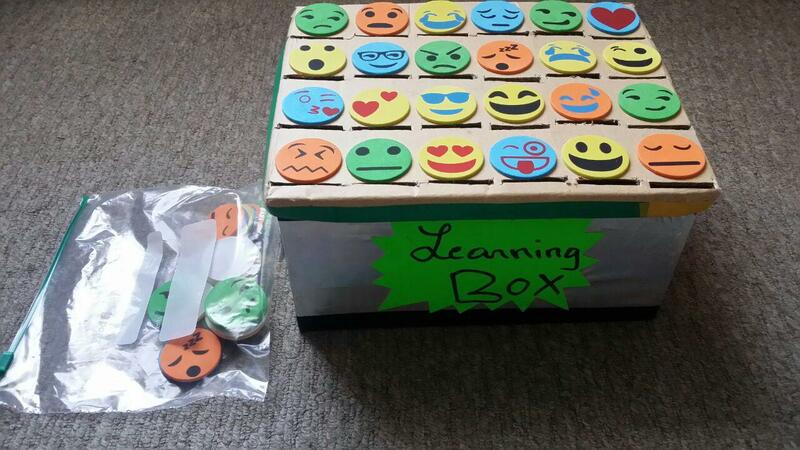 Here's a hands-on project you can also put together for your student/child. It's a visual discrimination project as well. It's basically matching, but a bit more complex because some of the images are very similar. The child would need to differential each image and put the correct one in the corresponding hole. 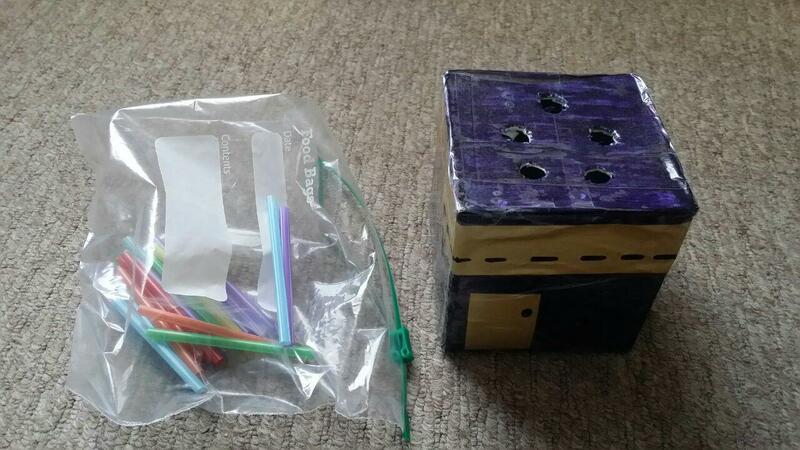 You would need: A shoe box, box cutter, self adhesive stickers of your choice (make sure they are doubled), storage bag to keep the pieces together. If you don't find stickers you like, print something from the internet. In which case you would need to cut them out with a pair of scissors, glue them, and laminate the other ones. I hope this pack and bonus will be beneficial to you. 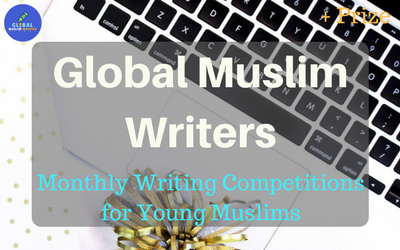 I would really appreciate your opinion after you use it with your child, in shaa Allah. Barakah Allahu feekum. 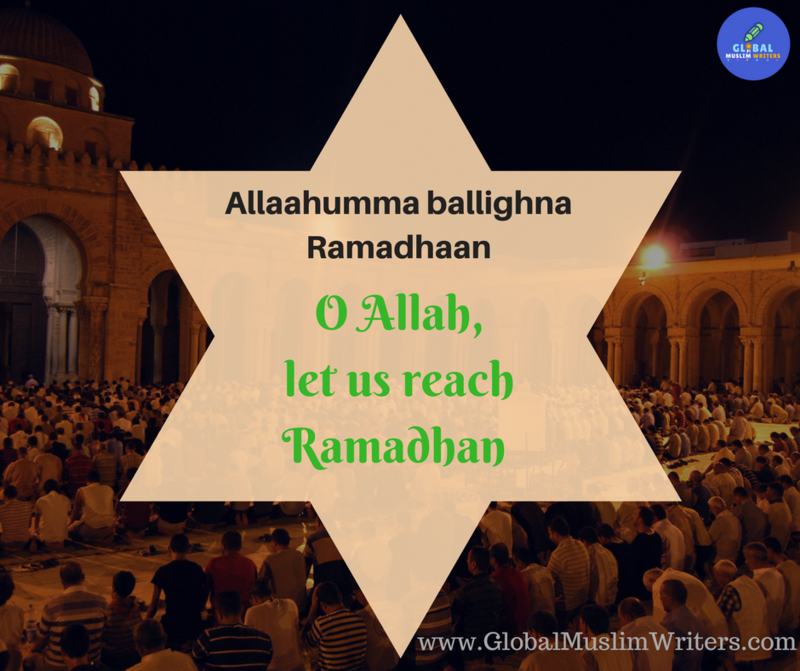 May Allah make us all reach Ramadhan and be of the successful ones. 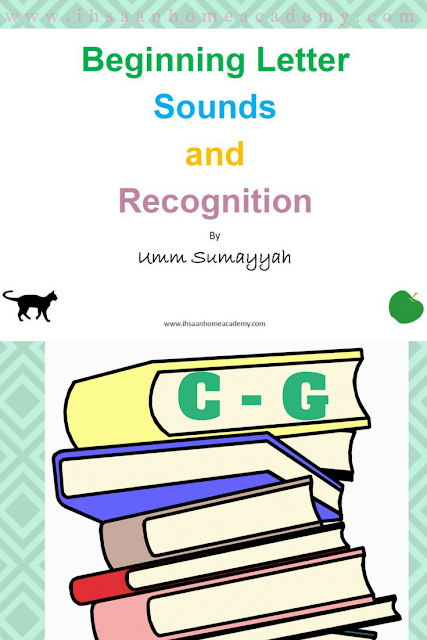 This is the second part of the Beginning Letter Sound and Recognition phonics activity booklet I started sharing in a previous post. This part has five letters. 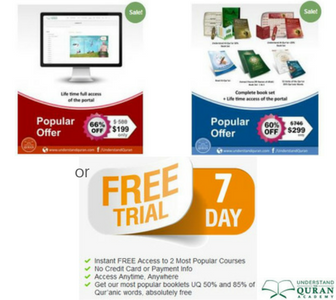 To download the preview pages, click here. 1. Images are displayed and students point to the ones that start with the given letter of the page. 2. 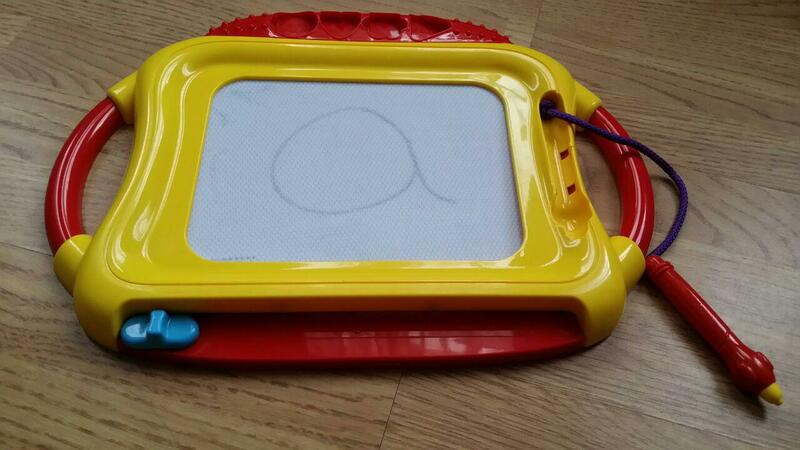 Students draw an image that starts with the letter. 3. Students trace the letter. All 26 letters will be available to you for free. 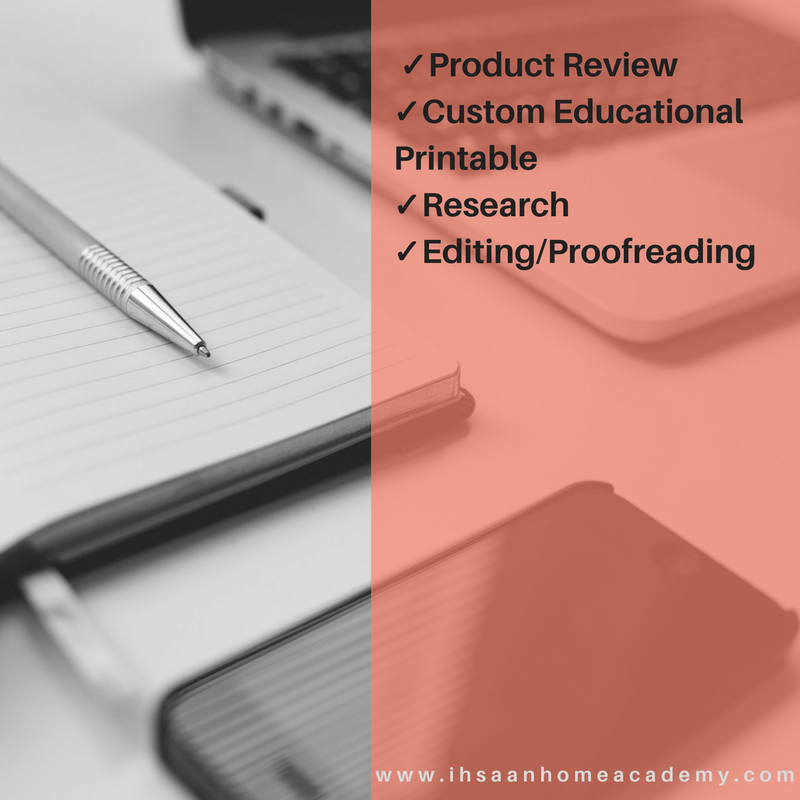 As I finish the project, I will upload the pages I work on in shaa Allah, then you'd be free to download them. 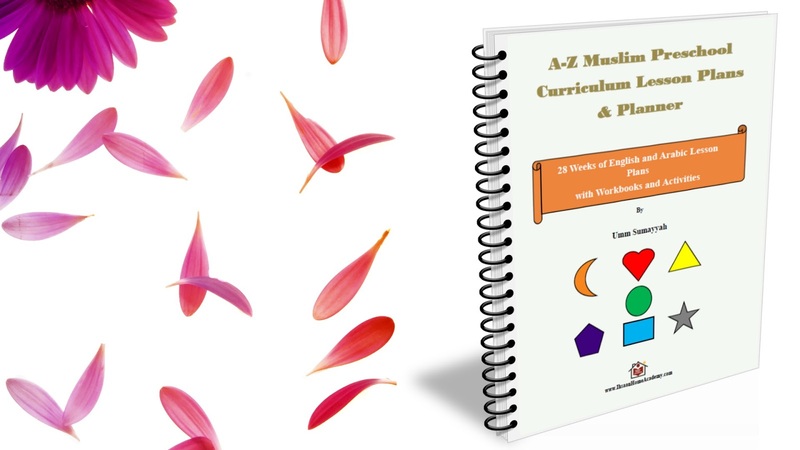 Once the project finishes, subscribers will have the opportunity to download the whole book with all the pages together in shaa Allah. So if you're not yet subscribed, subscribed by clicking the red button on the upper right corner of this blog to gain access to the subscribers' page when a new post is uploaded. Stay tuned for the next pages, in shaa Allah. Parenting is one of the hardest jobs a person could ever be responsible for, yet, a very rewarding one indeed. There isn't a parenting book that accurately tells a parent how to parent his/her child. And, babies aren't born with a manual on how to be cared for. There may be books here and there on parenting tips, but they don't fit every single child. Children are individuals with unique personalities, so they should be treated as such. It is helpful to get tips and advice from other parents who have had years of experiences or from professionals who have studied different child behavior, but tips should not turn into parenting commands. As parents, we shouldn't get too caught up in parenting tip articles, and here are some reasons why. Though they are often helpful, parenting tips are nothing more than ideas people usually share from personal experiences. Someone else may benefit from them, but it doesn't mean that every single person would. Even when those tips come from social studies, there still isn't a guarantee that they would also work for you and everyone else. Social studies aren't necessarily 'facts.' Different factors such as the social-economic groups of the sample of people being used for the studies, cultures, time/period, and other similar factors need to be put into consideration. 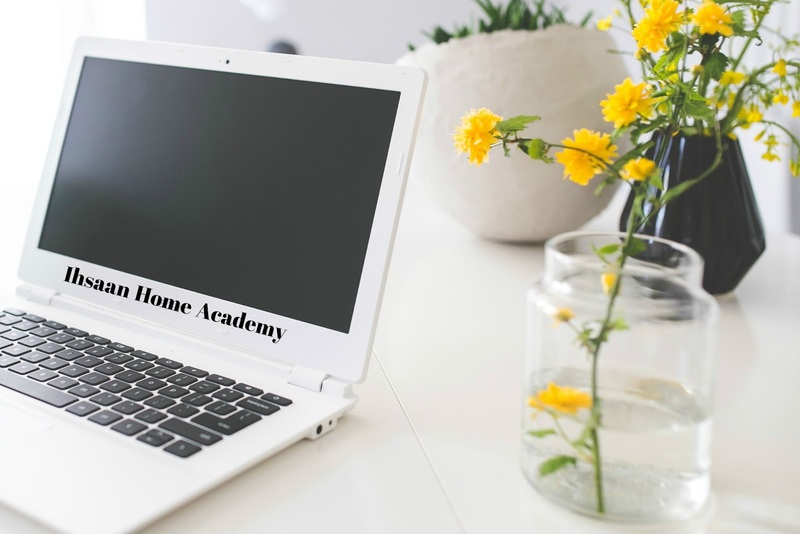 The problem with seeking parenting advice or excessively reading parenting tip articles is when some parents start thinking that the only way of doing some parenting act is by enacting what they have read. It doesn't work that way. What you read may be helpful to you or someone else you share the article with, but leave room for different interpretations. You may even come up with an idea that could be more beneficial to you. As I've mentioned before, children are individuals and need to be treated as such. We can't expect every tip to work on every child. Let's take discipline for example, every child responds to different types of disciplinary actions differently. It may be helpful to go through trials and errors to come up with the perfect one for your child. 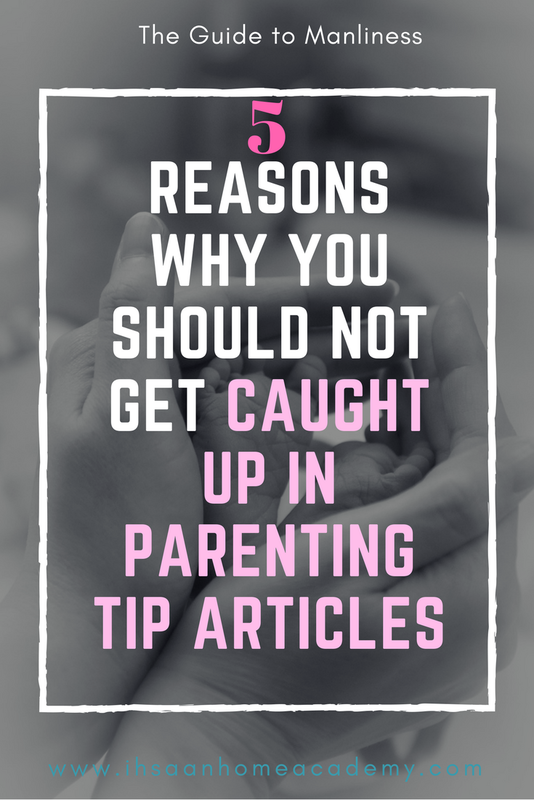 Of the few parenting tip articles that I have read so far, some did seem rather condemning than encouraging, even if that wasn't the intention. Honestly, after reading some articles, one can easily feel like the worse parent alive or feel as if he/she is doing it all wrong. Titles like, "10 Things You Should NEVER do as a Parent" sound very alarming, but not necessarily bad. It may become an issue when the list is comprised of things like "Do NOT tell your child 'Good Boy'" or "Do NOT tell your child 'You are Beautiful.'" Of course, there are always reasons people give tips and back it up with experiences and sometimes social studies. But, we should be very careful how such tips come across. Someone reading a title and tips like that could easily feel like a failure as a parent. Some things really aren't as much of a big deal as they are made to be these days. But even when we think they are, they probably shouldn't come under such alarming titles. People usually parent the way they know best, so we should assume the best, even when we disagree. That being said, tips are also welcome. We just need to make sure our tips come from a helpful, understanding, encouraging, and non-judgmental place. There are always extreme cases where some parents or parenting acts don't fit the acceptable norm. Such cases should be treated differently. One thing I've always found interesting is when people disregard that what's acceptable in one culture may not necessarily be acceptable in another. One of my passion in life is learning different cultures, languages, and trying to understand different people as best as I can. Whether I agree or disagree, I'm always fascinated with the way people think and behave based on where they come from or the ethnicity they belong to. Parenting also comes under the umbrella of things people do differently based on their environment and cultures. A good example of that is spanking. We can go back and forth about whether spanking is acceptable, but we can't deny the fact that depending on the society we have that conversation in, the conversation would be very different. There are extreme cases where we can all agree would be flat-out wrong, but even what the borderline of extreme is could differ from society to society. What makes a person a 'bad' parent in one society may not necessarily make him/her a 'bad' parent in another society. That's a reality we have to be willing to consider when talking about parenting; especially when addressing a diverse group of people. That's not to say that we should never challenge some of those cultural norms; we just have to come from a place of understanding and consideration. It's wonderful to share parenting tips and take tips from others, but we should try not to consider tips as facts that everyone should abide by. When reading parenting articles, take every advice with a grain of salt; including this one. Bookmark or take notes if you have to, but never feel the need to take on every advice as something you must do. Leave room for reflection, questioning, maybe consideration, or simply moving on. It's okay, and you're not a 'bad' parent for not taking every advice or abiding by everything you read.